Our M34 ripsaw fixed arbor ripsaws are available in opening widths from 31” to 118”. Our system utilizes a very fast system for changing the arbor between cutting patterns. The M34 is built for 3-shift production environments can be utilized to cut most any material that is in panel form. The machine is designed to rip your panels to width in a single-pass. We can also provide material handling equipment to efficiently provide material and remove it after ripping with very low labor costs. Our K34OU machine uses both a top and bottom arbor to allow you to rip and/or groove panels from both the top and the bottom side at the same time. We can precisely control the groove depth to within +/- 0.004”. 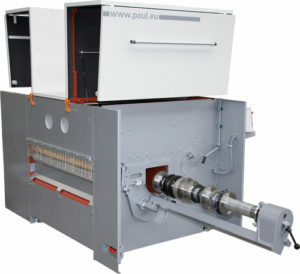 This machine can be used to produce bead-board, corner boards, miter-lock products, column wraps made from panel material such as MDF, plywood, particleboard, and plastic panels. The K34Vario machine allows you to rip panel material with the flexibility of CNC positioned blades to allow you to change your cutting pattern as needed based on a program. The machine is available in widths up to 118”. You can equip the machine with the number of moving blades required for your ripping patterns. 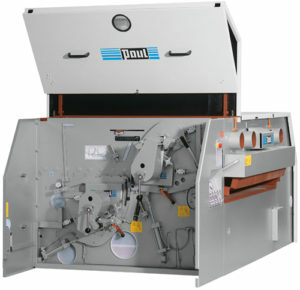 Handling equipment to automatically feed panels into the machine is available as well. Our SK and SKOU machines are designed for heavy and thick panel material such as LVL panels and can be equipped to rip only (SK) or a combination of ripping/chamfering of the finished product utilizing both the top and bottom arbor (SK-OU).